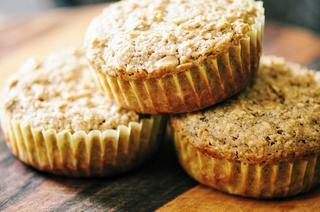 Super moist, fluffy, and delicious Gluten-Free Strawberry Greek Yogurt and Oat Muffins! These make a great healthy breakfast, snack, or treat! The flavor of these muffins is out of this world! Take my word for it. Every single ingredient perfectly complements the next. They are incredibly tasty. And to boot, they have a beautiful texture--moist, fluffy, & chewy all at the same time! Preheat oven to 350°F. Grease muffin tin or liners, set aside.In a large mixing bowl, combine dry ingredients. *If making your own oat flour, grind rolled oats in a food processor until a fine oat flour forms, usually 3-5 minutes.In another bowl, beat wet ingredients together.Mix your wet & dry ingredients together until just combined.Pour your muffin batter into your greased tin or liners.Bake for 25 minutes or until a toothpick inserted into the center of a muffin comes out clean. **Note: Any yogurt will work in this recipe, but I highly recommend strawberry, as the nutmeg really works well with this flavor!